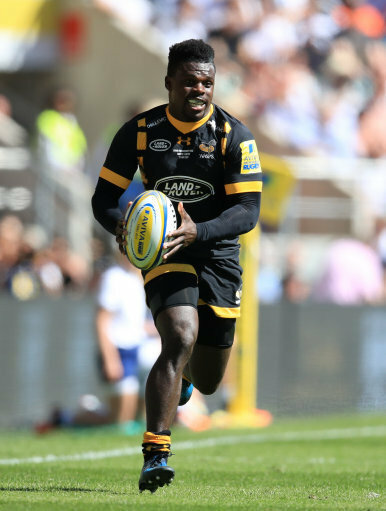 Christian Wade’s sudden retirement marks a sad day for rugby, that’s according to Jason Robinson – who believes the NFL-bound winger should be part of England’s World Cup plans. Wade, the third top try-scorer in Premiership history, dramatically quit on Wednesday after earning just one England cap in five years and he is now expected to join the NFL’s International Player Pathway Programme and try forge a career in American football. Although England have a wealth of options on the wing, no current Premiership player has scored more tries than Wade’s 82, but head coach Eddie Jones has continued to overlook him. And with the World Cup less than a year away and no sign of Jones’ opinion changing, Wade has given in. But Robinson, who switched from rugby league to rugby union halfway through his career, insists the Wasps man should have been given more of a chance – with his blistering pace and quick feet standing him out from the crowd. “When a player like Christian leaves it is sad because we all want to watch players like him, he inspires people,” said Robinson, who was speaking at Invictus Games Sydney 2018 while taking part in a Jaguar Land Rover wheelchair rugby exhibition match. “I do think he should have been given a proper go. He could be part of our World Cup plans, so it is a shame for him. I think he knows it’s never happening and that is why he has chosen to do it now. He knows he is not in England’s plans. “I am surprised he has not been, especially going back a couple of years. I thought he deserved more of a chance than he got but each coach has his ideas on what he wants and where he wants them. “The Premiership’s loss is the NFL’s gain and he is looking for a new challenge and I think everyone will keep a close eye on how he goes out there. “It won’t be easy. Not only will it be a completely different environment, it will be a completely different game. He has obviously thought about all of this and part of his decision will have been because he is not in England’s plans. Wade’s club side Wasps will feel the full brunt of his decision, especially with other star winger Elliot Daly now away with the national team for next month’s autumn internationals. It is a crucial month for Jones, who is under pressure to guide England back to winning ways following a disastrous Six Nations – where they finished fifth – and a summer series loss to South Africa. And, with the World Cup now less than a year away, Robinson insists the pressure is on ahead of a tricky autumn that involves matches against South Africa, New Zealand and Australia. “There is a lot of work to do for England and there is a lot of pressure on them, there is no escaping that,” he added. “We go on about the Six Nations, but the Autumn Internationals is the toughest month of the year because it is intense, and you are playing the best teams in the world back-to-back. “We are seeing how South Africa have just exploded and they should have beaten New Zealand twice, then it is the All Blacks for the first time in a while so that is massive. “Japan are the weak link but that won’t be easy before Australia – who have their own problems. We are a year off from the World Cup and this will give us a real gauge. Jaguar Land Rover is the Presenting Partner of the Invictus Games Sydney 2018 and is using the event to lead and inform the debate on future mobility, and how its future technology could help people’s lives.